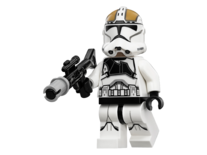 A Clone Gunner, also referred to as a Clone Trooper Gunner or AT-TE Driver, is a minifigure from the Star Wars universe, based upon a specialised form of Clone Trooper. The Clone Gunner has a leg piece with white legs and a black leg joint, and the standard The Clone Wars Clone Trooper head piece. The torso piece has several printing elements the same as the standard The Clone Wars Clone Trooper print, however and extra grey plate of armour is printed in the centre over the main chest plates, and the arms are a dark grey instead of white. The back printing remains the same as a normal Clone Trooper's. The helmet also shares the same printing design as a normal Clone Trooper's helmet, but has some additional printing above the visor. This is primarily Sand Yellow printing covering most of the area above the visor apart from the helmet's crest, and black Republic insignias on each side. Some Earth Green printing is also present directly above the visor. This minifigure is unarmed in the 8039 Venator-class Republic Attack Cruiser, but comes armed with a blaster in the 8014 Clone Walker Battle Pack. A Clone Gunner is playable in the Nintendo DS & 3DS versions of LEGO Star Wars III: The Clone Wars, its appearance is unchanged and is equipped with a Blaster. Clone tank gunners were Clone Troopers with specialised trained with firing artillery weapons and turbolasers, the training being more advanced than what most Clone Troopers received in this area. Weapons clone tank gunners often used included AV-7 Cannons, AT-TE canons and heavy repeating blaster on Juggernauts. These troopers were present in battles such as the Battle of Christophsis, the Battle of Teth and the Second Battle of Geonosis. This is a description taken from LEGO Star Wars Character Encyclopedia. Do not modify it. ↑ This minifigure was referred to as an "AT-TE Driver" in the 2009 Limited Edition poster given away as a part of the "May the Force Be With You" promotion. This page was last edited on 11 June 2017, at 00:04.